SOEKS-01M Geiger Counter / Radiation Detector with new SBM-20-01 Geiger�Muller tube. The Soeks-01M Geiger Counter is designed for assessing the radioactivity level of any item and detecting objects, food items and construction materials contaminated with radioactive elements. 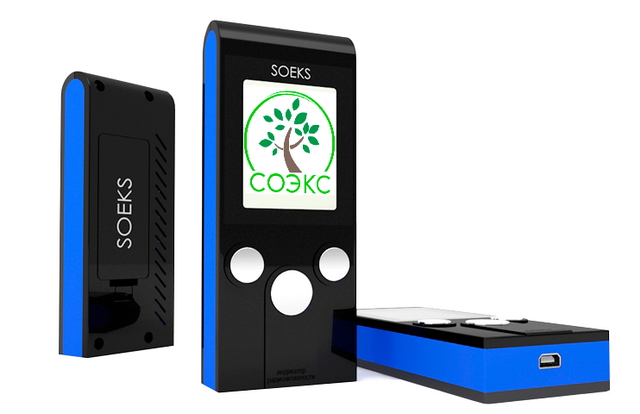 The Soeks-01M Radiation Detector easily gauges radioactivity levels based on ion radiation intensity (gamma radiation and beta particle stream) and x-ray radiation levels. 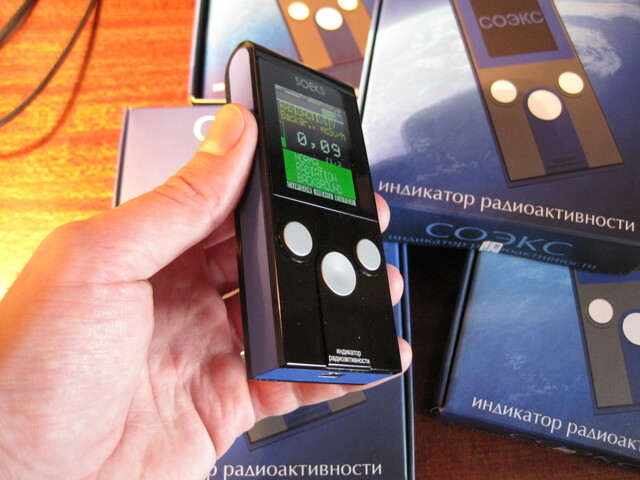 Soeks Geiger Counters were acknowledged Model of the Year 2011 due to their exceptional performance and high levels of precision. Typical radiation detectors display exposure dosage ranging from 5 to 1,000 ?R/h, while Soeks devices provide a higher level of precision, from 5 to 100,000 ?R/h. Only the Soeks Geiger Counter boasts a color display, graphical representation of measurements and 127 measurement points. The device also possesses a hi-tech design, is lightweight, compact and capable of being charged via USB. The biggest issue with standard issue devices of this type is that the majority of household radiation detectors have radioactive sensors made in the 80�s, right after the Chernobyl disaster, and as such, their life cycle is swiftly coming to an end. In contrast, Soeks Radiation Detectors possess sensors that are up-to-date and much more accurate. 2. Level in preset units. 3. Indicator of measured results fills up within 10 sec. If background radiation level is high, the result may be available much sooner. 4. Radiation level. Shown as large digits at the center of the screen. The first measurement also shows the word "MEASURE". 5. Message about background radiation. 7. 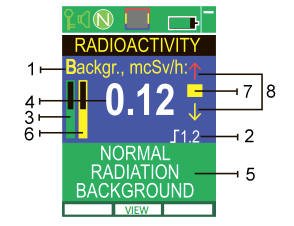 Defining radiation fraction indicator. If the fractions follow often, the indicator blinks yellow and red. If the fractions are rare, the indicator is yellow. 8. Indicators for radiation background changes.